Note: Font installation on Apple Mac and other operating systems is below. Also find tutorials on Urdu and Arabic copy/paste, fonts usage and Urdu typing. If you are on Linux or other operating system which also supports OpenType/TrueType fonts, then you can manually download and install the ttf files from here. The zip file contains 4 ttf files. Please follow your operating system instructions on how to install these fonts. Download the font zip file from here. 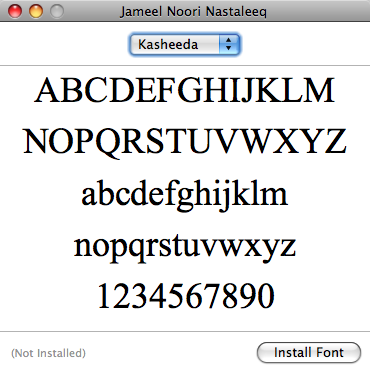 Extract the zip file and double click the these two ttf files to install: "Jameel Noori Nastaleeq.ttf" and "PDMS_Saleem_QuranFont-signed.ttf", and leave the other two fonts. When you double click the font file, you will be presented with a small preview (written in the Roman alphabet) along with a button at the bottom that says "Install Font" as shown below: Clicking it will install the font. These fonts work in Safari on Snow Leopard (Mac OS X 10.6.x).